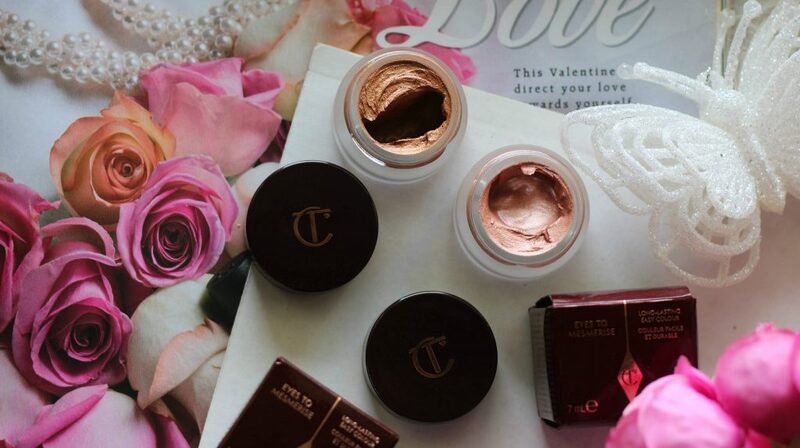 Charlotte Tilbury is one of my most favorite brand of makeup. 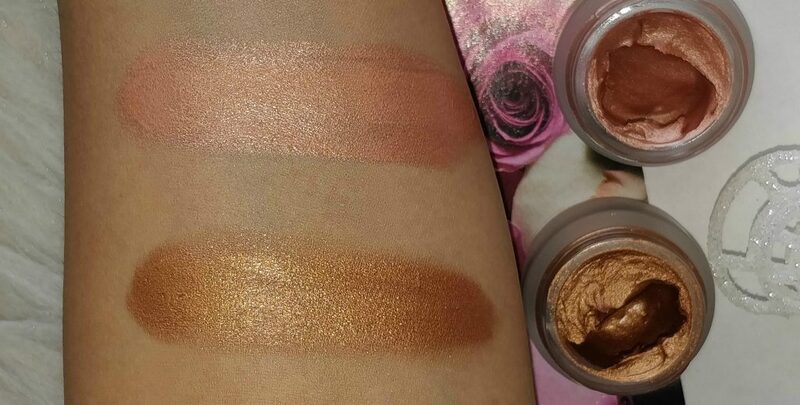 They released two new shades of the Eye to Mesmerise cream eyeshadows and I got sent these two lovely shades from the collection. Ever since I got them, I have been using them and I must say – I am so obsessed. Be ready to get mesmerized! 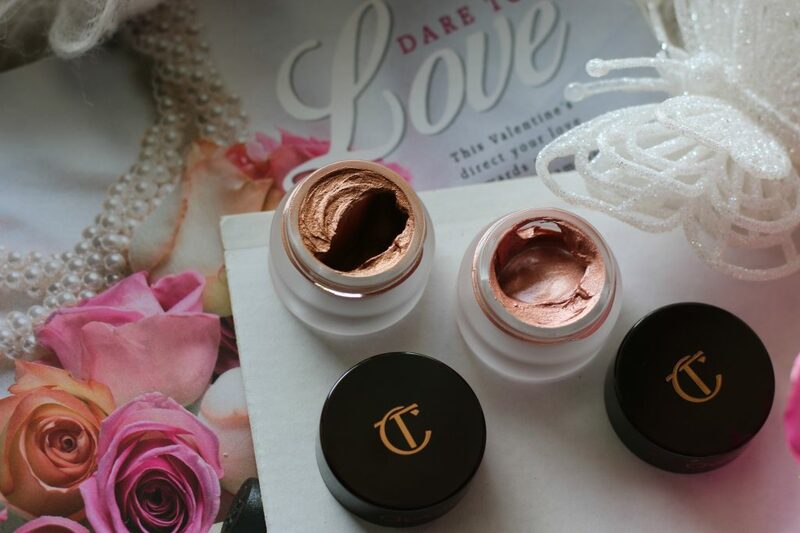 Charlotte Tilbury Eye to Mesmerise – $32.00 or £22.00 each ; Fill 7 ml / 0.24 fl. 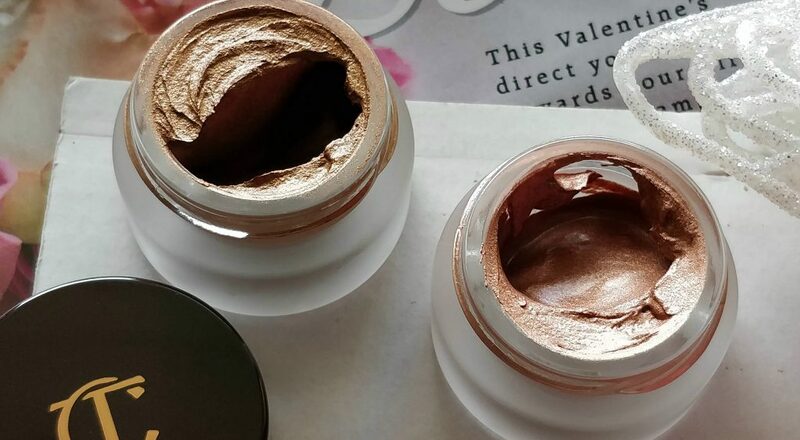 oz ; are are long-lasting cream eyeshadows. 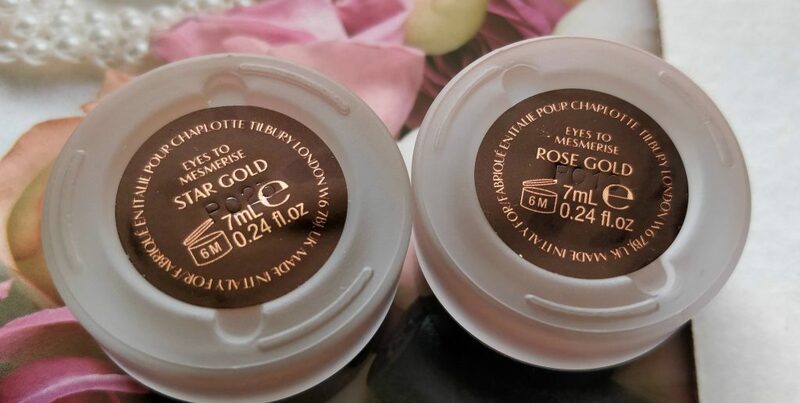 They are super pigmented and they come in this frosted glass post packaging! You just need a teeny amount every time and work with it. I use my fingers to apply it and later a blending brush to soften the harsh edges. Take the eyeshadow using your clean fingers for a soft, smooth, natural makeup look. Work it backwards & forwards like a windscreen wiper for a gorgeous wash of color. Use a Smudger Brush to run the eyeshadow underneath the lower lash line for added intensity. They look amazing on eyelids. They are not over shimmery or glittery. They apply easily and they are smudge proof and crease proof. The consistency is like a whipped creme. Glides on super easily. 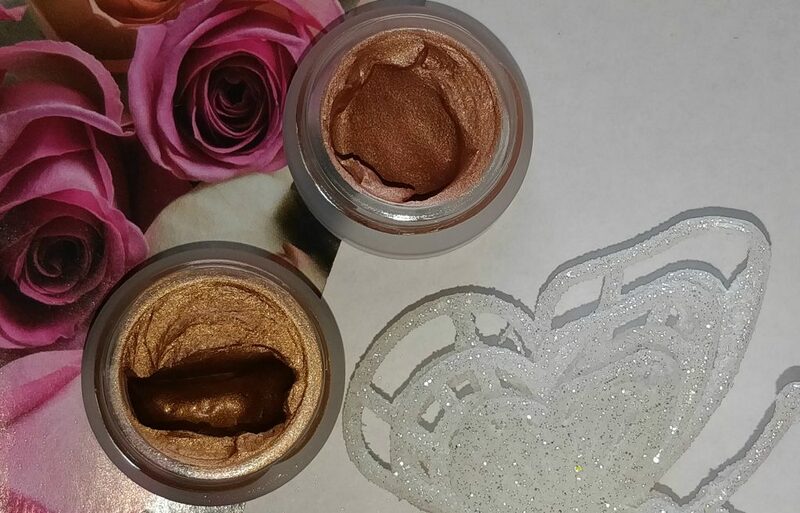 These creme eye shadows have a water-infused formula in a glowing metallic shade to create that maximum impact with minimal effort. 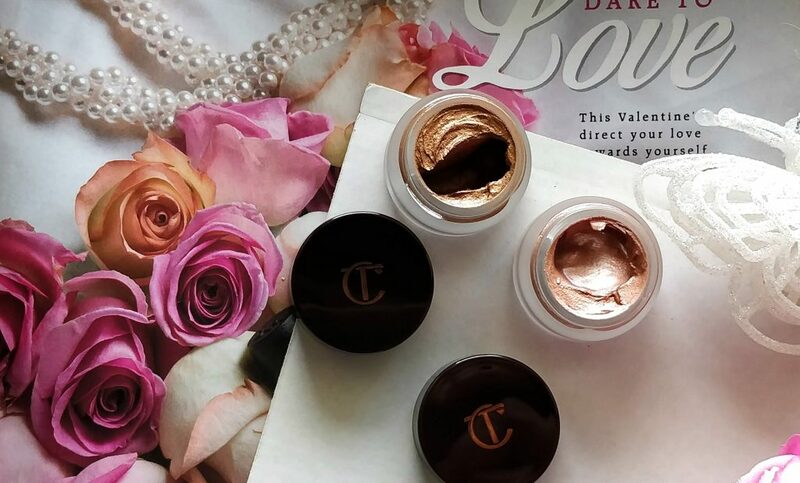 Best part about these eyeshadows is that you don’t require a primer underneath. On it’s own, these are long wearing, crease proof and smudge proof. Vitamin E hydrates & provides antioxidant protection from free radicals. 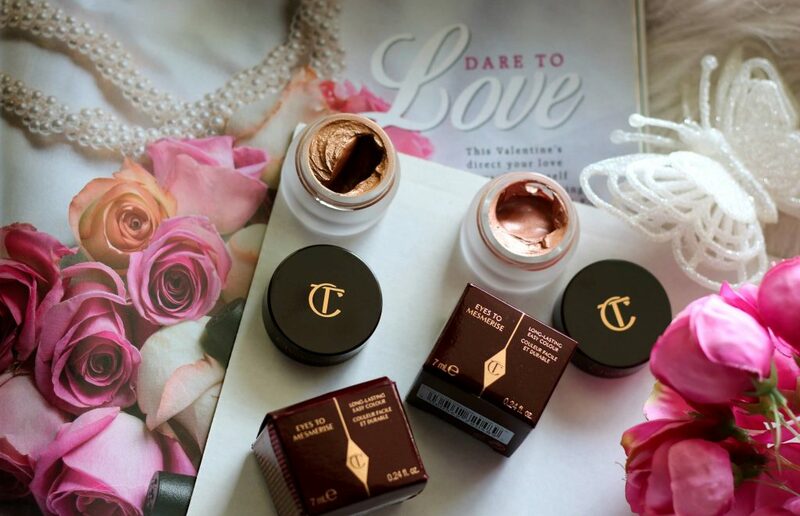 It’s soft-focus illuminating pigments smooth over lines & imperfections for a visibly more youthful finish. Cyclopentasiloxane, Aqua/Water/Eau, Mica, Diphenylsiloxy Phenyl Trimethicone, Cetyl Peg/Ppg-10/1 Dimethicone, Hdi/Trimethylol Hexyllactone Crosspolymer, Hydrogenated Palm Kernel Glycerides, Sodium Chloride, Dimethicone/Phenyl Vinyl Dimethicone Crosspolymer, Sorbitan Stearate, Disteardimonium Hectorite, Hydrogenated Palm Glycerides, Silica Dimethyl Silylate, Ethylhexylglycerin, Lauryl Methacrylate/Glycol Dimethacrylate Crosspolymer, Ceresin, Propylene Carbonate, Potassium Sorbate, Polyacrylamide, Glycerin, Sodium Dehydroacetate, Dimethicone/Vinyl Dimethicone Crosspolymer, C13-14 Isoparaffin, Silica, Laureth-7, Tocopherol, Ascorbyl Palmitate, Pentaerythrityl Tetra-Di-T-Butyl Hydroxyhydrocinnamate, Tin Oxide, [May Contain/Peut Contenir (+/-):Titanium Dioxide (Ci 77891), Iron Oxides (Ci 77491, Ci 77492, Ci 77499), Blue 1 Lake (Ci 42090), Yellow 5 Lake (Ci 19140), Carmine (Ci 75470), Aluminium Powder (Ci 77000), Ultramarines (Ci 77007), Chromium Hydroxide Green (Ci 77289), Chromium Oxide Greens (Ci 77288), Manganese Violet (Ci 77742), Bismuth Oxychloride (Ci 77163), Ferric Ammonium Ferrocyanide (Ci 77510), Ferric Ferrocyanide (Ci 77510)]. 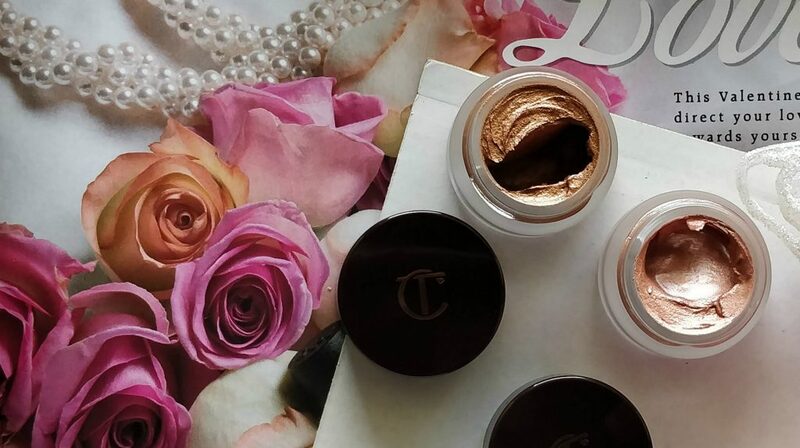 Charlotte Tilbury Eyes to Mesmerise – ‘Rose Gold’ is a warm pink with gold undertones and ‘Star Gold’ is a bronze gold with copper undertones. Overall, I love them. The formula is buildable, creamy and soft to work with. Comes in a a luxurious packaging. 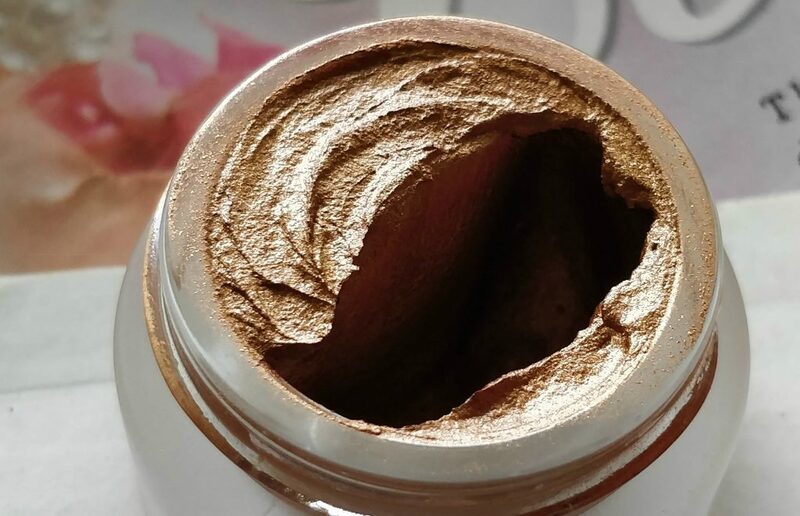 Unlike other cream eyeshadows, these doesn’t crease or smudge and you just need the teeniest amount for an intense look.The color is very true to how it looks in the pot. You don’t have to layer it down to get maximum intensity. Glides easily without tugging or pulling the delicate eye area and though they take few minutes to set, They are extremely long wearing. 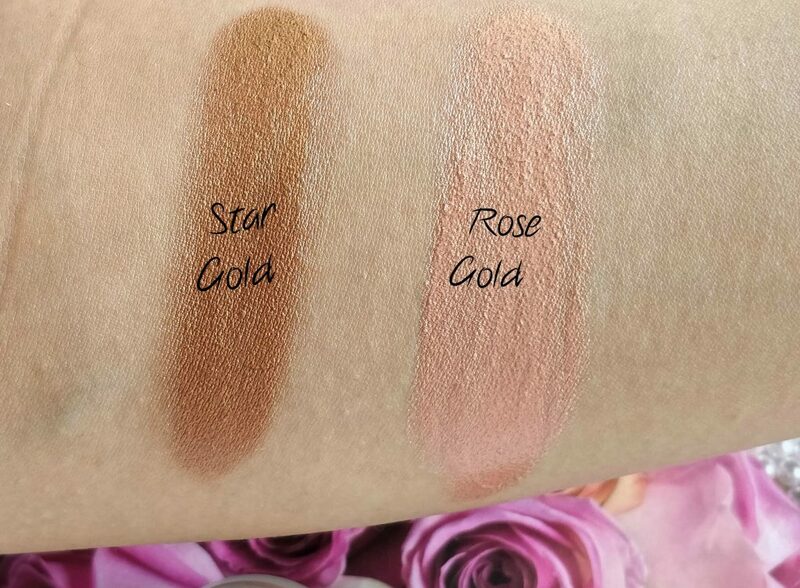 I love both Star Gold and Rose Gold. Great addition to my vanity. 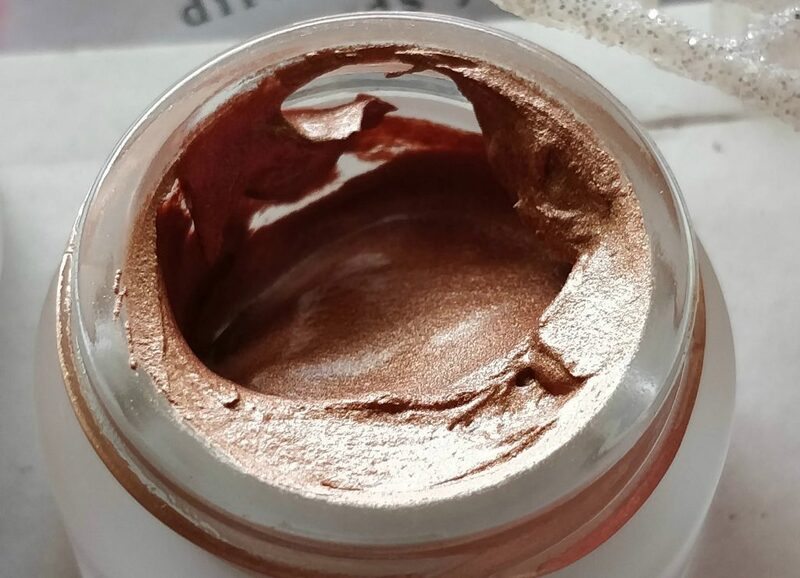 It also has a water-infused formula in a glowing metallic shade to create maximum impact with minimal effort. 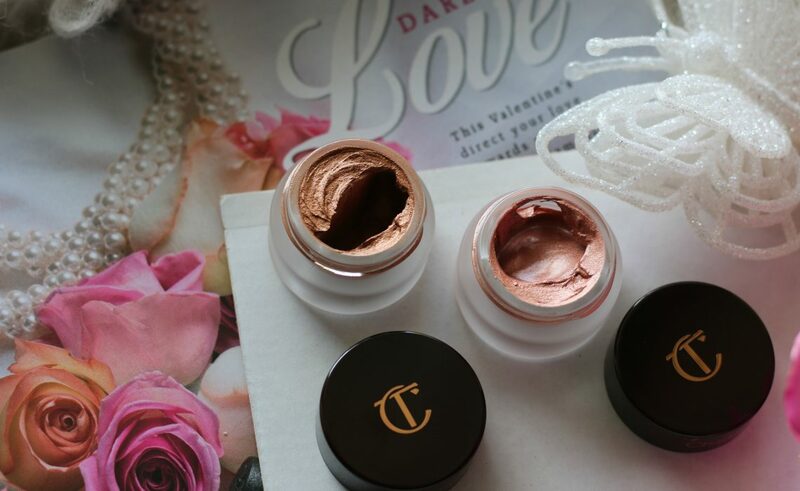 Availability – Charlotte Tilbury USA ; Be quick to grab them as these shades are limited edition. Ooh I love eye creams! They go on so easily and look amazing! I love that rose gold shade! That’s sooo gorgeous, and it’s such a trendy color right now! Ah I am so scared to use eye creams but these look like something I can try! ooooh rose gold please this looks so dreamy!! Want it!